Swiss banking group SYZ is unveiling its new advertising campaign focused on iconic personalities. SYZ is reviving its previous campaign through a pop art angle. It will be disseminated in Switzerland and Europe and showcase famous quotes that represent the Group’s values and position. SYZ’s distinctive advertising campaign made a strong impression in 2016 by adopting an unexpected style for a banking group. Two years on, the new campaign features a unique pop-art design and iconic characters. Developed by the communications agency Lunic, these visuals will be adapted to fit all traditional and digital support materials and circulated across Switzerland and Europe. The first visuals released pay homage to an historic character who left an indelible mark in the collective memory: Winston Churchill. 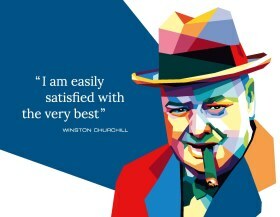 Unmistakable with his hat and cigar, the British prime minister left a lasting legacy, both through his unwavering conviction and timeless quotes. His saying, “I am easily satisfied with the very best”, exemplifies the emphasis on excellence the Geneva-based company has been promoting since its inception. Furthermore, SYZ Asset Management uses his famous maxim, “Difficulties mastered are opportunities won”, to draw a direct parallel with its multi-asset strategy, highlighting the fact that risk-taking produces conclusive results. Other famous people will soon be added to the advertising campaign to give it greater visibility.